Draw two circles on the cardboard to make your pattern, about 2 inches for bottom and 1 inches for head. 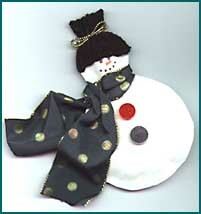 Fold brown bag in half, trace snowman, and cut out two pieces at same time. Paint with two or more coats of white paint. Make a small slit in the center of back bottom (this will be used to stuff a little poly fill in after glue is dry). Glue together around outer edge. I used Aleene's tacky glue. Hot glue two buttons on belly, I used a small red and green one. I put two dots for eyes and five dots for mouth. I used embossing powder for mine but if you have small beads that would look great. The hat is made with a man's black sock. Cut a strip from top about 1 1/2 inches x 3 inches and hot glue around top of head. Tie ribbon or a strip of fabric around hat and neck. Hot glue a pin on back. Add some glitter highlights for a little more sparkle.